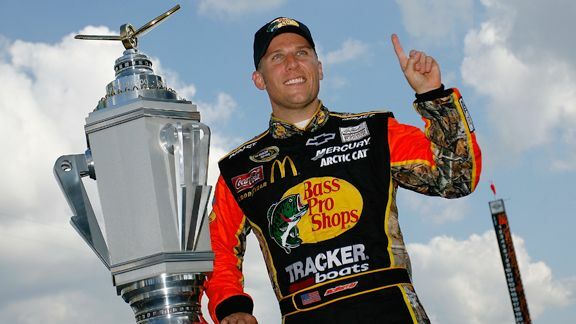 Jason Smith/Getty Images Jamie McMurray may well be celebrating after the Daytona 500 and Brickyard 400 again in 2011, but if he does, you can bet he makes the Chase this time. Some things are going to change for NASCAR in 2011. Things you saw in 2010 will not repeat next season. Did anyone really think we would see Jeff Gordon and Jeff Burton do their weak Ali-Frazier impression on the track at Texas? Dale Earnhardt Jr. finishing 21st in the Cup standings: Junior will crack the top 20 next season and possibly contend for the Chase, which won't be too tough if the playoff is expanded to 15 drivers. Steve Letarte on the pit box and moving to the No. 48 shop will make Earnhardt competitive again. A driver winning both the Daytona 500 and the Brickyard 400 without making the Chase: That bizarre quirk happened for Jamie McMurray in 2010, but Halley's Comet will make another pass by Earth before that scenario comes around a second time. Roush Fenway Racing failing to contend for the Cup title: RFR put three drivers in the 2010 Chase, but never seriously contended for the championship and didn't win a race until August. It was clear by the end of the season that Jack's boys had figured things out and the new Ford engine was strong. Carl Edwards won the last two races and teammates Greg Biffle and Matt Kenseth will join him as title contenders in 2011. The blindingly ugly front splitter: Like a teenager finally getting the steel removed from his mouth, the braces on the splitter will be gone and the overall look for the front of the cars becomes much smoother and more stylish. Jeff Gordon going winless for a season: Not with Alan Gustafson calling the shots. 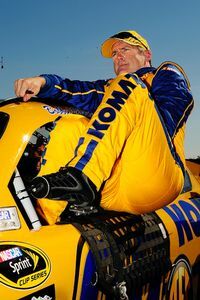 Gordon will return to Victory Lane in 2011 and seriously contend for a fifth championship. A full-time Cup driver winning the Nationwide title: Not officially, anyway. A real Nationwide driver will win it in 2011 because of rules changes coming soon that will keep the Cup big boys from racing for the crown in Nationwide. However, Edwards or Brad Keselowski still could win the most races and unofficially tally the most points if they run all the Nationwide races as planned. And a former Cup regular could win the title if Elliott Sadler gets it done while racing full-time in Kevin Harvick's Nationwide car. A pothole during the Daytona 500: Daytona has shiny new pavement that will be smooth as glass. Drivers will get a first test next week, but the new asphalt could make a big difference in how things look for restrictor-plate wildness in the season-opener on the 2.5-mile oval. Rusty Jarrett/NASCAR/Getty Images There will be better days ahead for Bobby Labonte. Bobby Labonte having to start and park: It was sad watching the former Cup champion forced to sometimes make meaningless laps and go to the garage. But he'll have a real ride in 2011 and a chance for some decent finishes with the No. 47 Toyota for JTG/Daugherty Racing. Richard Petty Motorsports trying to survive week to week: After the financial crash of George Gillett's empire, Petty managed to regain control of the team by finding new investors and placing RPM on solid footing in what will be a new-and-improved two-car operation with A.J. Allmendinger and Marcos Ambrose. Two Cup races at Fontana: Auto Club Speedway has one Cup race next year, which comes in March. Hopefully, most of the seats will be filled for the first time in a long time. The Chase opener in New Hampshire: The playoff starts at Chicagoland Speedway in 2011, adding another 1.5-mile oval to the Chase. A Sunday afternoon race at Texas in April: For the first time, the spring Cup race at Texas Motor Speedway will be a Saturday night show. Jimmie Johnson winning the Cup championship: Five-Time won't become Six-Time in 2011. Too many other teams and drivers are nipping at his heels now. No one stays on top forever, although it's hard to remember the last time someone besides JJ won this thing. Terry Blount covers motorsports for ESPN.com after 25 years as a sports reporter and columnist at three major metro newspapers. Terry began covering auto racing in 1995 at the Houston Chronicle before moving to the Dallas Morning News in 2001 as its motorsports columnist. Terry joined ESPN.com in 2006. He is an honors graduate of the University of Houston with a B.A. in radio/television communications. Terry was inducted into the media wing of the Texas Motorsports Hall of Fame in April of 2011 for his many years of covering the sport in Texas. Terry has earned numerous writing honors in his career, including the Citation for Writing Excellence from Hearst Newspapers and the Excellence in Journalism Award from the Houston Press Club. He can be reached at terry@blountspeak.com.